Had a power outage last night. Probably a good thing as I went to bed earlier than my usual 2:00AM. Going to have to get out of that habit soon or I’m not going to make it to class. Felt a little stone-age, but then again the same thing happened in New York City just a few years ago. 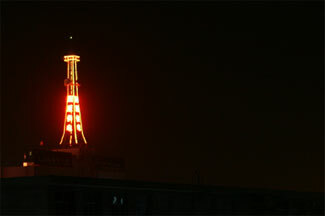 I looked out my window and saw a funny thing - the powerplants’ neon lights going full blast - a red glow to put me to sleep.